Small to Large Corporations - Shred Wise Inc.
Corporate compliance with today’s privacy laws is absolutely critical if you want to protect your business, keep the trust of your employees and consumers, and avoid possible hefty non-compliance fines. By offering customizable shredding solutions, Shred Wise is able to make it as convenient and cost effective for the small two-person firm as it is for the large corporation to keep their sensitive information secure. We apply shredding practices and procedures recommended by NAID, which ensures that their documents are properly destroyed in accordance with the strict requirements set by today’s local, state, and federal privacy legislation, such as FACTA (Fair and Accurate Credit Transactions Act), GLBA (Gramm-Leach-Bliley Act), and HIPAA (Health Insurance Portability and Accountability Act). 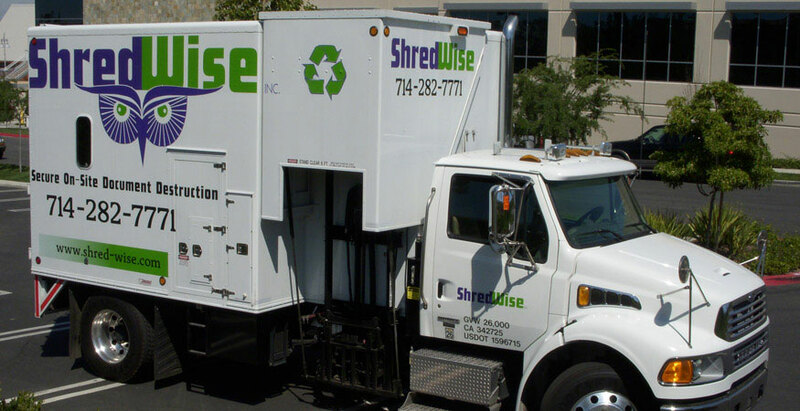 Shred Wise’s customizable shredding solutions include on-site and off-site shredding services, provided on an as-needed or ongoing, regularly scheduled basis. For one-time purges and occasional clean outs, clients can either arrange to send out our mobile shred truck or panel truck to your place of business or bring their documents directly to our facility in Orange any day of the week. Our mobile shred trucks allow for quick, curbside paper destruction, while our panel trucks make it possible for us to securely pick up and transport a very large quantity of sensitive documents for off-site destruction. For businesses that need document destruction services on a regular basis, we can set up onsite shredding to be performed weekly, biweekly, monthly, bimonthly, or quarterly. To arrange for ongoing onsite shredding services, our clients need only sign a simple service agreement that outlines the frequency of our visits, the service rate, the option to use our secure shred containers for free throughout the duration of the agreement, and the ability to cancel our services at any time with just 30 days’ notice. Call family-owned and -operated Shred Wise today to learn more. We’ll gladly provide your small, medium, or large business with an estimate over the phone, and answer any questions you may have about current privacy laws; creating, implementing, and managing a records retention schedule; and training your employees about how to keep protected information secure. We will also help you determine the best shredding solution for your needs and budget. Shred Wise is licensed, bonded, and insured.